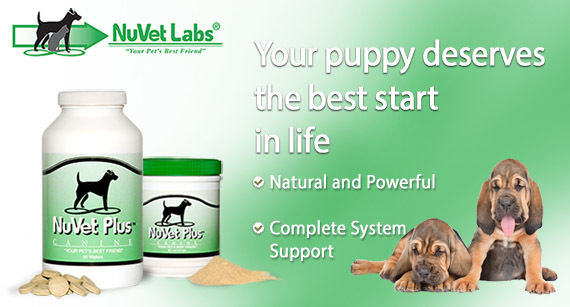 NuVet Plus for Growing Pups! NuVet Plus – A Taste Pets Love! Made with Real Chicken Liver! The excitement of a new puppy can be made all the more joyful when they are made comfortable and well taken care of. When a new pup is ready to leave the litter, usually at around 9 weeks, it’s important that certain needs be met that will help them bond with their new family. Just like a newborn child, puppies need food, water, a warm place to sleep, plus lots of love. Commercial and raw food diets can leave big gaps in their nutrition. A quality nutrient supplement will provide essential vitamins, minerals, amino acids and enzymes crucial for developing pets. The first two years of a puppy's life are critical for building a strong immune system, bones and organs. NuVet Plus® is a scientifically formulated nutritional supplement that helps to promote the proper development of young dogs in several crucial ways, which is why your breeder recommends they stay on this for at least their first year of life! Puppies and kittens need a healthy immune system, which is responsible for defense against environmental toxins, by-products and unwanted pathogens. NuVet Plus® contains Blue Green Algae which is a very rich chlorophyll source and has been shown to enhance the health of the entire body, strengthen the immune system and promote intestinal regularity. 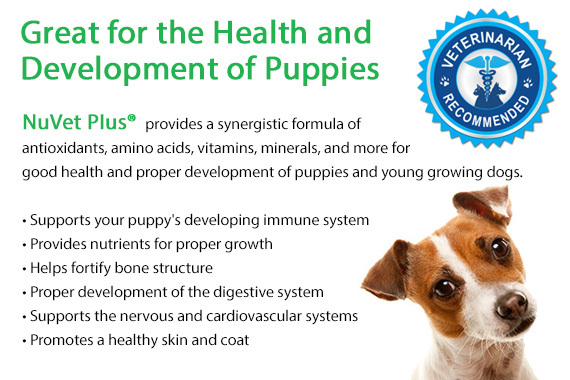 NuVet Plus® is the best nutritional supplement for young canines; perfectly balanced to provide the most effective fundamental and essential ingredients that can help defend your new puppy from toxins and nutritional deficiencies.